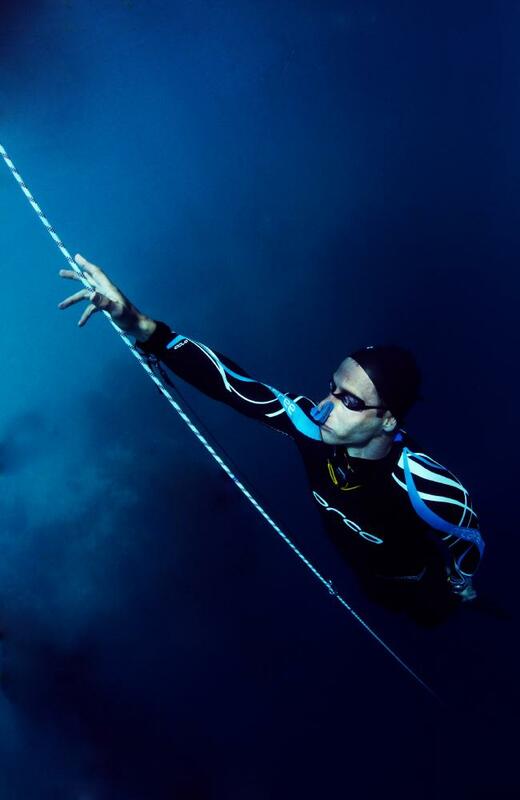 ANT Williams can hold his breath for eight minutes, but one dive into a pitch black abyss pushed his mind, and his body, to the brink. IT WAS the deepest freedive I had ever attempted. Looming beneath me was the deep abyss of Dean’s Blue Hole that plunged to a depth of 200m. I slowed my breathing and checked my heart rate. The head judge signalled me over as my name and target depth was announced by the commentator. As I clipped on to the competition line, I knew there was no room for fear. Ten years earlier I had been working as a sport psychologist for a motoGP team in Europe. The two riders I had the responsibility of “making go fast” were small, tough blokes who had broken all manner of bones during their extensive careers in motorcycle racing. I had also worked with boxers, mountaineers, kickboxing fighters, high-speed ski racers, extreme endurance athletes, rally car drivers and big wave tow-in surfers. What drew me towards these athletes was their unflinching composure before taking on something terrifying. I was plagued by the fact that I had never succeeded in sport, moreover anything remotely dangerous. I felt like a fraud. Everything I shared with my athletes came straight out of a text book. I had no first-hand knowledge of the techniques I was teaching. Somewhere within me I knew that I had to experience a dangerous sport. And that in doing so I would form a closer connection with the athletes I was trying to help. It was this belief that lead me to freediving. 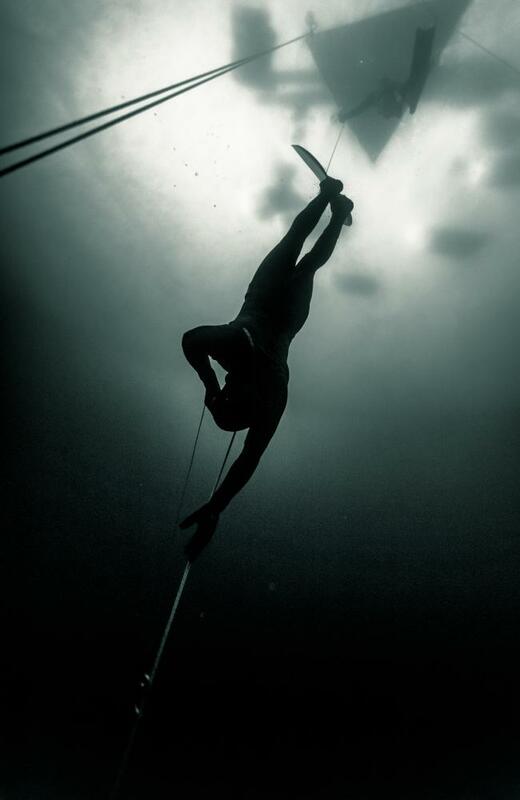 Freediving is a sport that traces its roots back to ancient times. Free swimming to depths of 90m or more asks extreme questions of an athlete’s body and psyche. The ability to overcome the body’s natural urge for oxygen in deep water requires a remarkable level of strength, stamina, determination and commitment that few people possess without many years of training. I found the sport frightening, but at the same time highly addictive. To this day I struggle to explain why I compete in this sport. There just seems to be something marvellous about descending to impossible depths in the ocean, and to be completely at peace with the foreign world around you. Applying what I knew about mental toughness training, my performances began to improve quickly. Before long I had a breathhold of over eight minutes, in a pool I could swim 225m on a single breath, and in the ocean I was descending to -80m without anything but the air in my lungs. My journey had taught me the ability to stay calm under severe pressure, in a sport where there is little hope for the athlete that loses his nerve at the critical moment. But the dive in the Bahamas tested me in new ways. It was 2012 and I had announced a target depth of -100m. Some 20m deeper than I had ever attempted in competition. Off the surface I had to swim hard to overcome the buoyancy created by the enormous amount of air I had packed in to my lungs. By 20m the weight of the water above me was so heavy that I continued to sink, without the need for more kicking. At 60m I was surrounded by pitch-black darkness and my throat felt like it was being choked. There is nothing more solitary than sinking along in the ocean. The fear. The brutal discomfort. At depth you are crushed by the water pressure — your chest shrinks to half its size and your trachea begins to collapse. The same pressure on land would cause massive internal damage. When I finally reached 100m I saw a steel plate lit by high-powered torches. I reached out for a tag and my mind was screaming for me to do it fast. Swimming up I was desperate for air. I realised it had been three minutes and the ocean was still pitch black. I had no frame of reference and terror began to set in. Am I stuck? Am I still at the bottom? I eventually arrived back at the surface where the sense of accomplishment was overwhelming. In that moment it defined who I was and what I believed I was capable of in this world. For the next three months I woke up every morning with a brimming smile believing I had achieved the impossible. To achieve something great in life you must start by taking positive, calculated risk. It’s not easy, or comfortable, but anyone can learn how to do it. Life might feel safer when we keep things within our control. But taking risks is an incredibly valuable source of self-discovery. Every time you push through an obstacle you learn something new about yourself. It builds your resilience and boosts your self-confidence. It helps you redefine your limits and break free from the average way of thinking. Ant is a guest on Tuesday’s episode of Insight at 8.30pm on SBS, which asks what drives people to push their bodies to the limit?